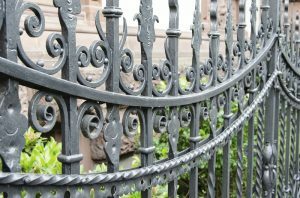 Keep your wrought iron looking new with these tips! Do you have a wrought iron fence on your property? Although these types of fences are durable, they will become dirty over time. If you want to enhance the curb appeal of your property, you need to clean your fence every once in a while. With that said, keep reading and discover a few tips on how to clean your wrought iron fence. The process of cleaning a wrought iron fence is rather straightforward. Your first order of business should be to get yourself a big bucket and fill it with soap and water. You can use any dish soap that you have around the house. From there, you can use a rag or scrub brush to remove any debris from your fence. Use a hose to wash away the soap when you are finished. You do not want to leave any soap on the fence because it can leave any unattractive residue and water spots. Sometimes, dirt and debris will be really caked onto your iron fence. In addition, bird droppings are difficult to remove as well. Don’t be afraid to break out a scrub brush and give it some elbow grease. Sometimes, standard dish soap is not enough to clean your wrought iron fence. If you have mildew or mold on your fence, you may need to mix up a special solution. Get a spray bottle and fill it will a touch of bleach that is diluted with water. Spray this solution on any mildew or mold to kill it and prevent it from growing. After you spray it, you need to let it soak in for a few minutes before you rinse it off. This entry was posted on Friday, September 28th, 2018 at 5:21 pm. Both comments and pings are currently closed.